The Bugatti Chiron, the world’s most powerful, fastest, most luxurious and most exclusive production super sports car, is coming to Monaco to celebrate the opening of the French luxury brand’s new dealership location at the heart of the principality. “Monaco is inseparably linked with the brand history of Bugatti. Louis Chiron, who gave his name to our new super sports car, was born here and became a legend when he won the Monaco Grand Prix in 1931,” said Dr. Stefan Brungs, Member of the Board of Management of Bugatti Automobiles S.A.S. responsible for Sales, Marketing, Customer Service and Brand Lifestyle, during the official inauguration. The Monaco Luxury Group, founded in 1959, has been an official Bugatti sales partner since 2013 and has extensive experience in the sale of luxury vehicles in Europe. Bugatti’s Monte Carlo showroom is located on the ground floor of the Fairmont Hotel at the heart of Monaco. The entry section has a show area that sets the scene for the star of any Bugatti showroom – the Bugatti Chiron. Blue, Bugatti’s brand colour, predominates in the modern presentation which is characterized by pronounced lines and clear surfaces, like Bugatti super sports cars. A horizontal communication strip running along the wall is used to display product information and images as well as highlights from the history of the brand. 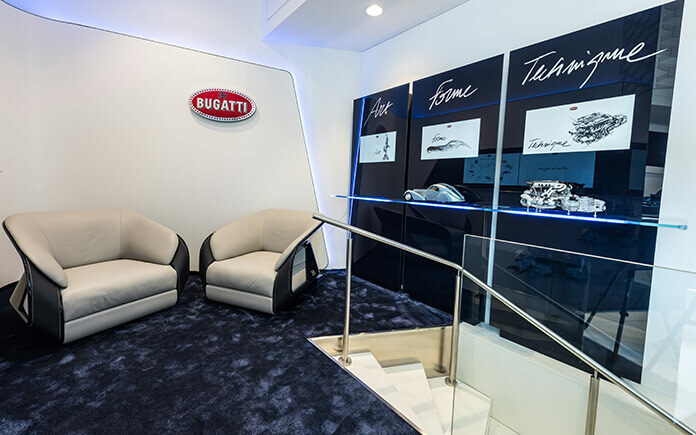 The new showroom concept gives visitors an opportunity to experience the Bugatti brand values of Art, Forme, Technique and the flair of the company’s headquarters at Molsheim in Alsace. For example, there is a heritage section devoted to Bugatti’s brand values. Each of the values is illustrated by one wall-mounted pillar, each featuring a screen with films and animations focusing on the particular value. Customers can also configure their new Bugatti here. Everything can be controlled intuitively using an iPad or tablet after customers have taken their seats in the luxurious lounge. The lounge is equipped with furniture from Bugatti Brand Lifestyle, designed especially for the brand’s new showrooms. The organically shaped armchairs are made from the finest leather and blue carbon fibre, high-grade materials requiring complex craftsmanship of the type which are also used in Bugatti super sports cars. The sides boast the EB logo. Next to the showroom, the world of the Ettore Bugatti Collection presents itself with elegance, the finest craftsmanship and exquisite design. The items in the collection, with a distinctive cut and refined details, are all individual creations crafted in Italy using the most exclusive materials available. In the boutique, you can also find precious items from Bugatti’s watch partner Parmigiani Fleurier as well as valuable writing utensils from Montegrappa and fine examples of glass art from Lalique. After Milan, London, Tokyo and Munich, Monaco is the fifth location in the world with a Bugatti brand lifestyle boutique.